STEP 1: Pre-heat the oven to 180°C. STEP 2: Put the flour, butter, ground ginger and bicarbonate of soda in a mixing bowl. STEP 3: Mix it all together with fingertips until crumbly. STEP 4: Add sugar, syrup and egg and mix until it forms a firm pastry mix. STEP 5: Using the rolling pin, roll out the pastry to about 5mm thick. Make sure the surface and the rolling pin is well dusted with flour. STEP 6: Cut out the shapes with a knife and/or pastry cutter. STEP 7:Place the cut out pastry on a greased or non-stick baking tray. STEP 8: Place the baking trays in the pre-heated oven. And bake for 15 minutes (check after 10 minutes). Remove from the oven and allow to cool. STEP 9: Make the icing by combining the icing sugar, egg white and 1Tbs of water into a bowl, then beat with an electric mixture until smooth. Add more water if necessary, until the icing is a thick yet runny consistency. STEP 10: Place the icing into small piping bags. 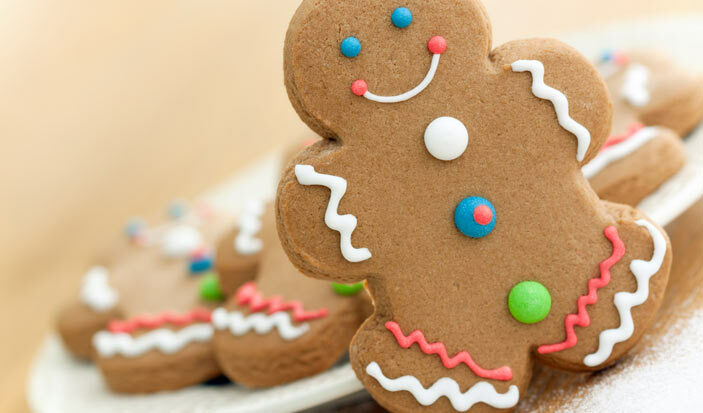 STEP 11: Decorate the ginger bread cookies with the icing by piping your desired pattern.